Rinpoche wrote this letter to a student with advice on how to care for a cat that was twenty-one years old and very sick. Rinpoche suggested various mantras and also advised circumambulation of holy objects with the cat. I heard you wanted very much to come here but you have a cat that is twenty-one years old and is very sick, so you couldn’t come. I understand, that’s very good taking care of the cat. Also recite the Three Principal Aspects of the Path and different lamrim prayers. The most important thing is to take the cat around holy objects. If you can, make an altar on a table, and put many holy objects on the table, piled up—tsatsas, buddha statues, pictures and texts, then take the cat around, on the same level as the altar. Put pictures of buddhas, and statues and tsatsas, as many as possible, then go around that. However many holy objects are there—one hundred or one thousand—each time the cat goes around the holy objects, it creates that many causes of enlightenment. It is good to have many tsatsas there and to take the cat around them as much as you can before he dies, otherwise there is nothing much you can do. 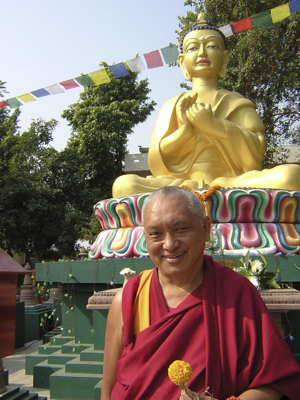 Please continue to make your life most meaningful for every sentient being with bodhicitta. Thank you very much. I hope to see you soon.